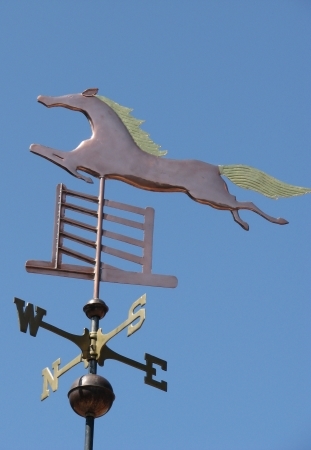 With our Running Stallion Weather Vane we capture the fluid grace of a warmblood in motion. 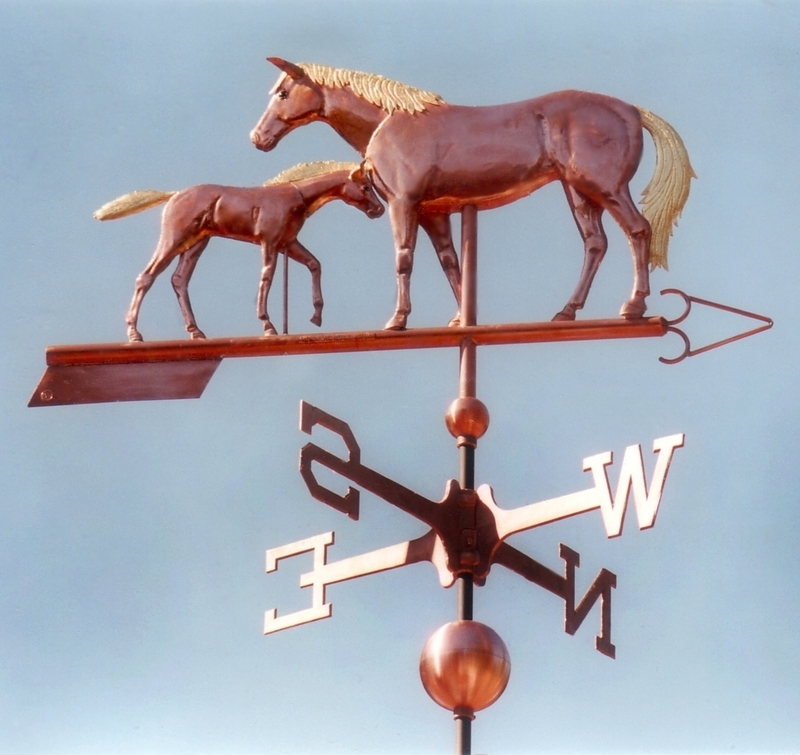 Because our artisans handcraft each weathervane sculpture piece to individual order, we can personalize this weathervane in a number of ways. With the application of optional gold and palladium leaf we can represent individual markings. Further, we can make this stallion with a braided mane or different tail. 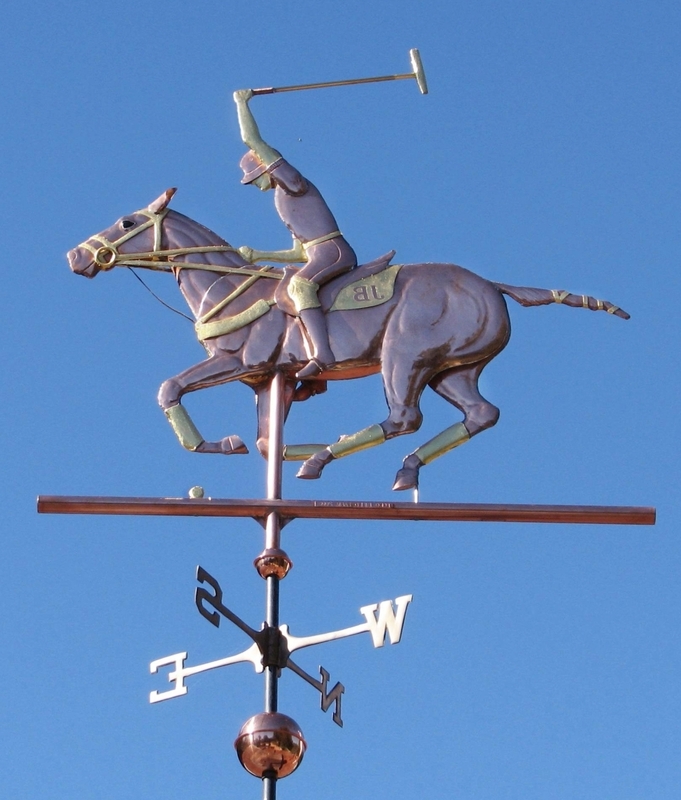 We can add an arrow to the sculpture piece or put grasses and/or a hillside beneath the horse to transport it into a natural setting. If you want, we can even place a rider on its back. 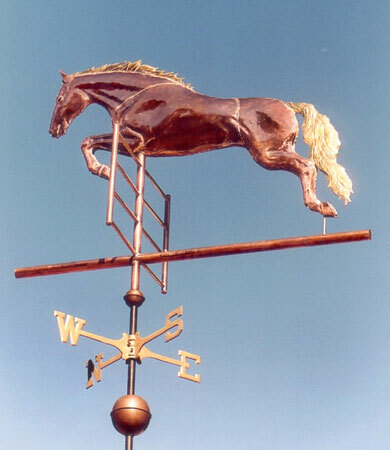 We often modify our original designs prior to their construction to literally turn one of our standard horse weathervanes into a portrait weathervane. 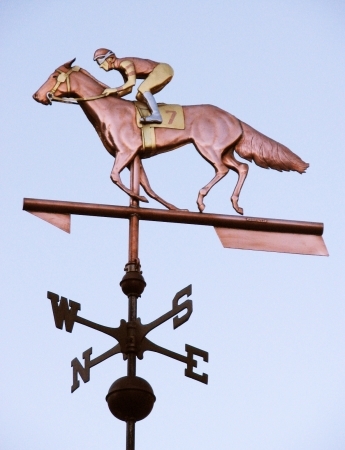 For example, the stallion shown above was made in copper with optional gold leaf details on its ‘socks’. As the copper color naturally deepens with age the socks will become increasingly distinct. And you can choose the color of the glass eyes on your horse. 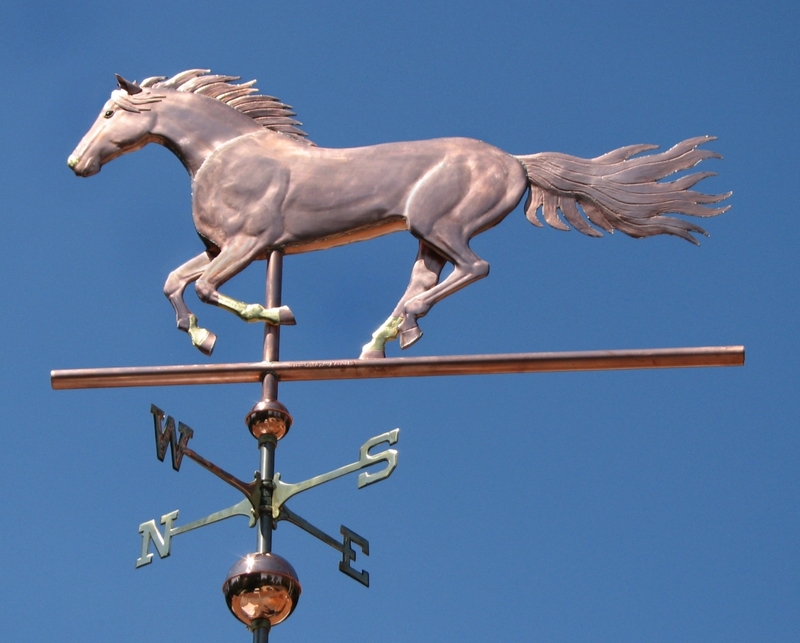 If you like this style of weathervane, we also make dynamic Rearing Stallion and Running Horse Weather vanes. 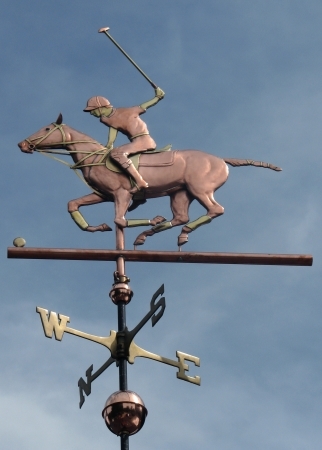 The mystique of the stallion in the arts and literature is well established. Movies like Black Beauty, The Silver Brumby, Man From Snowy River, The Black Stallion, and Spirit, the Stallion of Cimarron are all well known films that salute the beauty and power of the stallion. Important to many cultures throughout the world, stallions are used for breeding and maintaining or improving bloodlines. 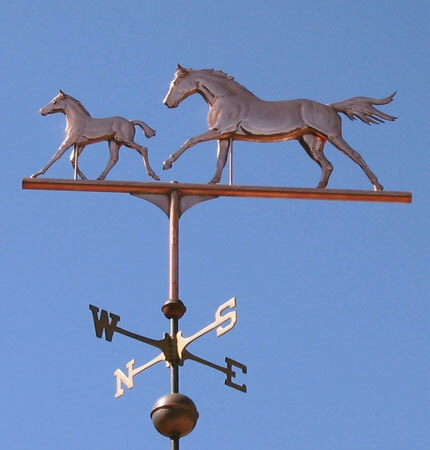 Stallions have a more muscular physique and usually have a thicker, ‘cresty’ neck as compared to mares and geldings. 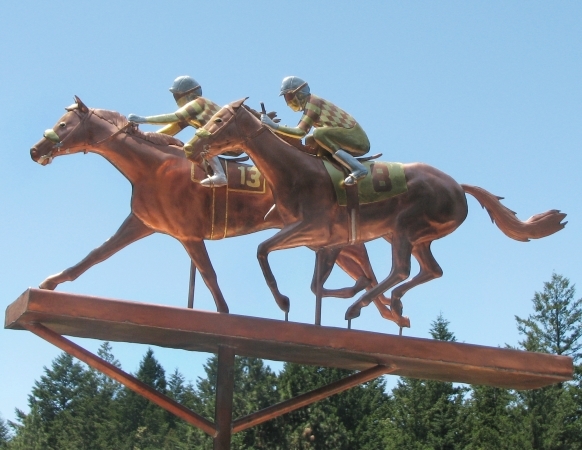 They often have a fiery temperament and are especially popular for upper level dressage work and show jumping. 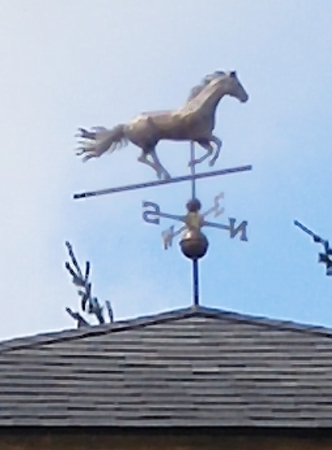 The profile of this weathervane against the skyline is very beautiful. 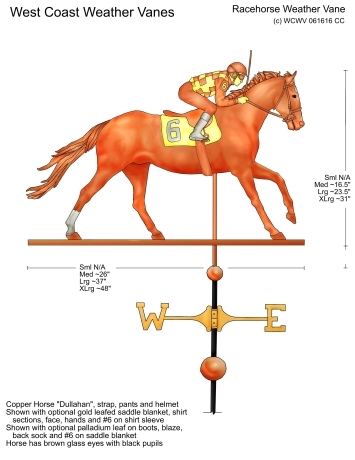 The ins and outs in the mane and tail and the four staggered legs help create a sense of speed and elegance. Placing this Running Stallion Weathervane atop a home, barn or riding arena will add a lovely finishing touch to any structure.